The Washington Nationals arrived in South Beach last night in desperate need of a few wins, and had Stephen Strasburg going for them on the hill in the series opener. This season, Strasburg’s only hinderance has been a lack of run support, and he has been cheated out of several wins because of it. Luckily for Stras, the Nationals’ offense showed up early, and struck for three first-inning runs off Nathan Eovaldi. Unluckily for Stras, his arm did not show up in the first inning, and the Marlins struck for five. After four batters in the bottom of the first, Strasburg had walked the bases loaded and recorded one out. Marcell Ozuna then laced a bases-clearing triple to center field, past Denard Span. The ball hit off the deepest curve of the wall next to the sculpture, and stalled on the warning track, allowing enough time for Ozuna to scamper to third after all three runs had scored. Had the ball caromed harder towards right field, based on Span’s route, Ozuna may have had enough time for an inside-the-park grand slam. A Derek Dietrich RBI single and a hit by Adeiny Hechavarria set up runners on the corners with one out. Rob Brantly then struck out swinging, and just when Strasburg thought the nine-hole would save him from the inning, Nathan Eovaldi lasered an RBI single into right field. In the last of the second, a walk maligned Strasburg again when he issued a free pass to Ed Lucas. Giancarlo Stanton followed with a home run to right field. Since his return from injury, Stanton has become more disciplined at the plate, and is working on hitting the ball to the opposite field, an extremely valuable skill for a power hitter. 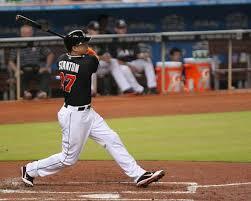 And he has enough power to even hit the ball out to the opposite field, even at Marlins Park. Eovaldi stayed sharp through six innings, allowing just the three runs while striking out five and walking four. Strasburg was chased after two, giving up seven runs on five hits and walking four. All four batters that Strasburg walked eventually scored. The Nationals’ commentators, Bob Carpenter and F.P. Santangelo, compared this game to a Marlins-Nationals contest last September during which Strasburg allowed five runs over three innings and walked three. That turned out to be his final start of the 2012 season. While Strasburg will not be shut down at any point this year, last night’s start was a major bump in the road for him. Inconsistencies occur during every pitcher’s season, and need to be worked through. But if nothing else, Strasburg needs to re-establish command of the strike zone so that he can afford to pitch around threats such as Giancarlo Stanton. If not, there’s plenty more where this game came from.